Our house had grown too small and it was time to make a decision. 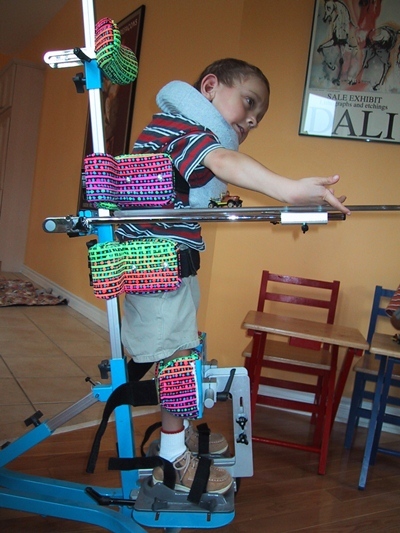 Owen had recently acquired his first piece of large equipment – a standing frame. A huge apparatus with a large H-shaped base designed to support the swiveling standing frame on the top. Tilt it back to lie Owen on it flat so we could strap him in, legs straightened, hips aligned, spine in order. Attach the knee-block so he wouldn’t buckle with weight-bearing. Head-support so he wouldn’t slump. Lock the wheels and slowly tip the frame upright. Ta-da! Standing. The frame itself was very heavy. Easily 75 lbs. 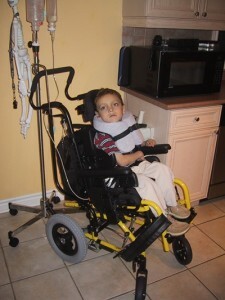 Small plastic castors ensured poor mobility and a bumpy ride for Owen. It was god-awful ugly with a light blue coating on the metal frame and a vibrant print on the padding and straps. The footprint of the base was about 5 ft by 4 feet so the whole thing wouldn’t tip over when Owen was in it. We’d already had a custom ‘seating system’ which could tilt and recline and with a hydrolic base that could elevate him up and down. It also had an outdoor base into which we could insert the seat itself. This was relatively small, taking up the same space as a large highchair. The stander was much bigger. It may not have been the exact thing that initiated our need to move, but looking back it’s as good a thing as any other to pin it on. The future equipment, the wheelchair we knew was coming and general accessibility all played a part. We knew we had to move. “The Toronto District School Board has signing programs for Deaf kids. York Region doesn’t. Everything is oral up there. Just stay south of Steeles.” Owen’s speech-language pathologist was adamant. No problem! I didn’t even know where Steeles really was. Somewhere out there in the ‘burbs. We were downtowners, living in a Victorian semi in Leslieville. My life was downtown. Michael worked in the north end of the city but he didn’t mind – he commuted against traffic and mostly worked from home. Her warnings were irrelevant. No need to go north. We looked first in our adjacent neighbourhoods, visiting inaccessible house after inaccessible house, imagining ramps, elevators, lifts. Every house was wrong or a hopeless cause – our radius of tolerance widened to include areas north of Bloor, then north of St. Clair (heading dangerously into North Toronto, which we couldn’t afford), leafy Leaside and retro Parkview Hills to the east. Crossing Yonge to the west was unthinkable (for reasons unknown but it was an unspoken agreement). We also spent an inordinate amount of time investigating an infill new-house project in a trashy neighbourhood in East York. The builder was unhelpful and dragged its heels in sorting out the need for an elevator. We weren’t yet despairing, but worry was setting in. We had already sold our current house and were working on a deadline. Michael would scope out neighbourhoods on his lunch hour. His voice was echo-y. He was in the basement of a brand new house in a new development. One of the model homes that hadn’t yet sold. A large bungalow-style house, 2300 square feet on one floor. The Town of Markham. A small city in the Region of York, whose southern border touches the City of Toronto at Steeles Avenue. Driving north on Markham Road from the 401 you see stretches of industrial parks, a Leon’s furniture outlet, several strip malls with diners, Asian grocers and discount dollar stores. At Steeles itself, a “Welcome to the Town of Markham” water fountain occasionally overflowing with soap bubbles that spill onto the street, evidence of hijinx of bored teenagers. Further on, Asian restaurants, off-brand knock-offs of fast food and coffee chains (did that say Coffee Lime?) then eventually big box stores, a Costco and a Food Basics. There was a cute downtown strip somewhere, but not on the way to the house. Turn right onto 14th Avenue, make your way to Legacy Drive. Winding roads to simulate randomness and charm. This development had been built on the back 9 holes of the IBM golf course – the remaining 9 were now a small public course. Could I live here? Really? Didn’t help that this time of year was depressing. Bleak and grey. No fluffy snow, no signs of spring. Just cold and bare. And have you ever driven through a new street that has only saplings for trees? Then maybe you can imagine how I was feeling. I pushed open the front door, which was unlocked as Michael reported, and looked around. Expanse of a house that went on for ages. I counted the paces from the front to the back – almost 40 steps. Jeez it was huge. The doorways were oversized, perfect for getting a wheelchair around. Marble tile flooring through the hallways, hardwood in the living areas. No carpets! Big, low windows. I looked out the front room and saw the accessible playground across the street. It was like the house was made for a kid in a wheelchair. Michael was right. It was perfect for us. I gave myself pep talks. We’ll do it for Owen. For Angus. We need more space and we drive everywhere anyway. And I’m not working. It’s only Michael’s job location that matters and this is way closer for him. I still plan to homeschool the boys so whatever she said about school programming doesn’t matter anyway. Friends said: I grew up in the suburbs! It’s not so bad! Our real estate agent had become a friend, an advisor, a sounding board. Memorably, he joked: It’s a great house! I’ll never come visit you, but it’s a great house! I get this…because I know Toronto and I KNOW Markham…hee hee hee. But…is there a “rest” of that story….? We have the stander too. It sits gathering dust because Sophie’s ankles turned too much. The spouse won’t let it go. “Maybe we could use it when she’s better.” Better? Better than what? Ugh.